Glasgowmusic.co.uk - Review : "Niteworks at The Oran Mor � Celtic Connections 21/01/12"
"Niteworks bring their Gaelic electro folk fusion to Celtic Connections "
A connection with a different type of Celtic started my day off with a flyer. Smile on my face it was time to head along to my first Celtic Connections show this year and boy was I excited. I had previously seen this band in October as part of their EP launch. They took to the stage at 1am that night, a brave thing to do in a nightclub when people want to dance to DJs. Within minutes the place was going crazy to their Gaelic, Sub electro sounds, me included. 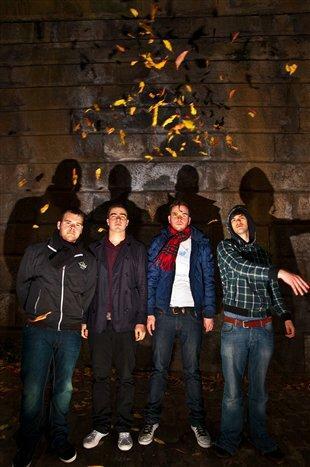 On the way out of the club that night I was presented with a download card for their EP �Obair Oidhche� which subsequently racked up the repetitive plays on my iTunes at a quicker rate than my sisters repeated listens to 90s pop songs growing up. It didn�t take long to persuade myself that this Gaelic electro fusion would feature on the BBC Radio 1 A&R Zone, I even thought about learning some of the native tongue in order to introduce the song in the feature. At the Oran Mor, the opening of the show with a tune from that EP �Subdisco,� set the tone nicely with the sold out crowd quickly getting into the vibe of what was to be the next hour. Niteworks driving rhythm section and layered Synths had me confused for a second, I had to check I was at Celtic Connections the traditional Scottish music festival and not in a Balearic night spot. The electronic bagpipes and array of wind instruments with the Gaelic vocals brought me back to the festival. If Leftfield had came from Skye I think this is what they would possibly have sounded like! By the second song a raver who was clearly missing the Slam Tent and Creamfields started his own one man Islander hands in the air routine, the rest of us quickly followed! I found out a lot of this crowd had travelled for this show, coming from the highlands, Islands and cities all around Scotland. To make this probably the most travelled to show this year in Glasgow even one of the members flew back in from Germany (Where he is currently studying) for it. The reaction from the crowd suggested it was well worth the travel! Towards the end of the set the track �Luaidh� had a girl invited onto stage to sing the Gaelic tune with a nice electro beat underneath before venturing into a clap along and then taking us all on a electro dance rave. The band had massive smiles all over their faces and sang along to every word minus the mics. Niteworks could not hide their delight at selling out this old church at the top of Byres Road. The drummer in particular was jumping up throughout the whole show, he even got on the mic towards the end to thank the audience, something he said he�s never had chance to do, and was quickly told to sit back down! The Encore quickly became the after party we all wanted. The entire set built and built up to a crescendo of electronic dance music that had the crowd at a level I didn�t think could be surpassed. How could they possibly follow it up? The band raised the game, the crowd raised their hands, and some even took their �Taps Aff� in response to the incredible techno dance music that was blaring out over the PA system. As a special surprise the support band �Donald MacDonald & The Islands� joined Niteworks on stage. The Drums, Synths and Traditional wind instruments of Niteworks were now joined by Fiddle, Acoustic Guitar, Fiddle, Banjo and Cajon. Donald MacDonald sang the vocals over this amazing collaboration. Niteworks are for fans of live music and of clubbing, for fans of Hot Chip, Groove Armada, Leftfield and many other dance acts. They are also for fans of Scottish Traditional music and have really brought the genre right up to date. The way they mix the genres together is to be admired. This review has been viewed 5713 times.